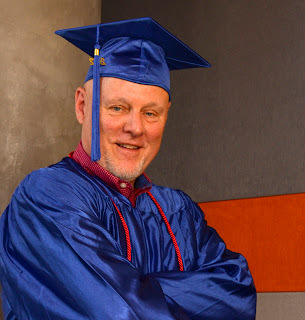 Of the 627 students who received degrees at Rio Salado’s recent commencement ceremony, perhaps none define perseverance better than Gregory Kosko. In January of 2009, Kosko lost his job due to corporate economic cutbacks. Later that year, he was diagnosed with Essential Tremors, which later escalated into Parkinson’s disease. Kosko knew he couldn’t let his situation stand in the way of going back to school for a degree to further his re-careering options. Kosko began researching his educational options and settled on Rio Salado College. In addition, Kosko also considered Rio Salado’s Disability Services department when choosing his college. Kosko also credits technology in helping see his academic goals become reality. He used Dragon voice recognition software to assist with taking online classes. Now the holder of an Associate in Arts degree, Kosko can focus his attention on the future, which includes further education and helping others with disabilities. Kosko plans to continue his education at NAU by earning a bachelor’s degree next year, and then to pursue a master’s degree in education. Published in the Tempe Republic Saturday, May 19, 2012.